Today we speak about two incredible missions conducted with Autonomous Underwater Vehicles (or AUVs). We first speak with Oscar Schofield from Rutgers University in the US about his fleet of gliders that can spend months at a time at sea, and some of their amazing achievements like crossing the Atlantic ocean. 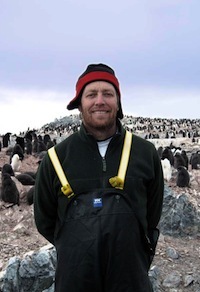 Our second guest is Mark Moline from the Center for Coastal Marine Sciences at Cal Poly State in California. He just came back from an expedition in the arctic where he used AUVs to discover that there are some agitated forms of life, in the deep cold. 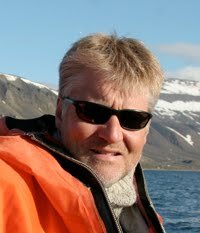 Oscar Schofield is Professor of Bio-Optical Oceanography at the Rutgers Coastal Ocean Observation Lab or COOL lab at Rutgers University. Schofield tells us about the autonomous underwater gliders that the COOL lab uses to explore the depths of the ocean for months at a time, mapping currents and collecting valuable data on our oceans. These masters of efficiency cruise the oceans by taking advantage of small changes in buoyancy, gliding through the water in a saw-tooth pattern by pumping small amounts of water in and out of their torpedo-like bodies. Schofield focuses on the specific case of the Scarlet Knight, a fantastic little glider that managed to cross the Atlantic Ocean fully autonomously while dodging fishing nets, strong currents and even the occasional shark. This resilient little glider’s mission was meant to inspire a new generation of engineers and scientists to take advantage of the power of robotics to take care of our planet and help preserve its wealth. Mark Moline is Professor at the Biological Sciences Department and part of the Center for Coastal Marine Sciences at Cal Poly State in California. He just came home from a month-long expedition in the arctic with a team of 17 people and different types of exploration robots. 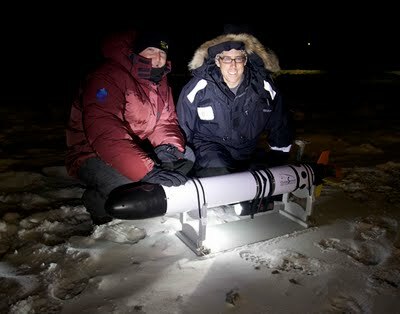 In particular, he tells us about the work done with his AUVs in observing life under the icy arctic surface. To his surprise, the organisms and life forms he found there were well awake, courting and moving instead of the cold winter stupor which was expected. Moline also discusses challenges which arise when using robots in freezing conditions, such as ice accumulating on the robot when it is at the surface or having to find holes in the ice to emerge. Interestingly, the technology used to scan the ice could prove useful to effectively monitor global warming. Finally, he tells us about other missions he’s planning with AUVs to monitor penguins and discusses the use of underwater robots to study biology in the future. While the definition does fit many robots out there, we were able to find, as promised, a couple counter examples. For example, artistic robots, entertainment robots and useless robots, don’t necessary fit the bill. We’ll be continuing the discussion until we get our holy grail definition so keep them coming at info@robotspodcast.com. For more information on the Willow Garage’s free PR2 robots, lateral sense organs for robots and the two innovative Taiwanese burglars misusing a low-noise surveillance helicopter, visit the Robots Forum.